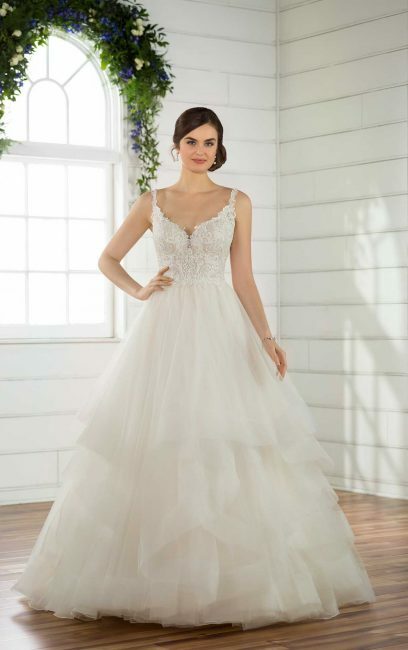 Say yes to your forever in this perfect princess wedding dress from Essense of Australia! Soft, organic lace adorns the bodice of this dress, accented with a V-neckline and organic lace straps. From the waist, the organza skirt extends into a full ballgown, creating ruffles and is finished with a horsehair trim. The back of this gown features a multi-strap, geometric design, adding a flirty touch to this princess style. Textural ivory and pearl beadwork adorn the gown giving off a subtle sparkle, and a short train completes the look. The back of this princess wedding dress zips up beneath fabric-covered buttons and is available in plus sizes.